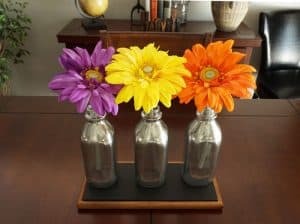 Mason Jar Flower Caddy - Girl, Just DIY! 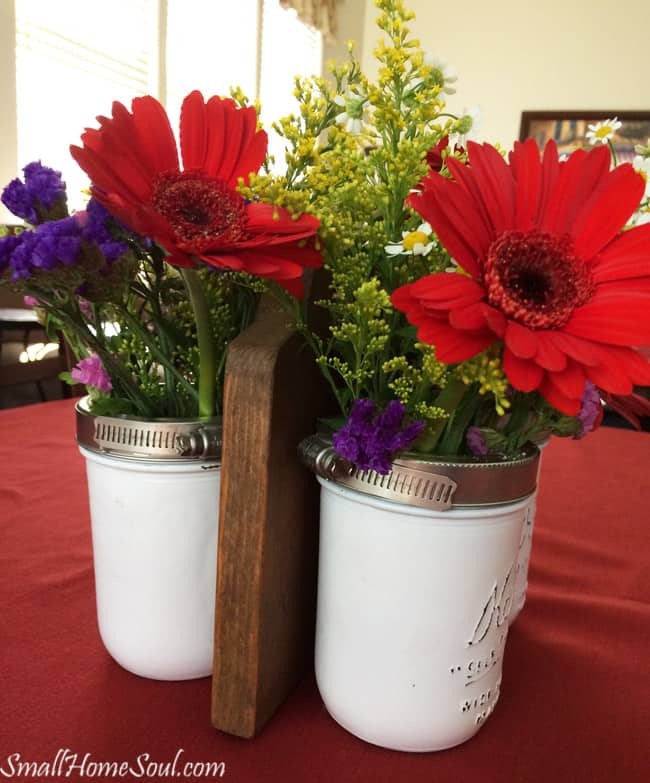 Hi Friends, I just have to share this Mason Jar Flower Caddy with you today! A few months back I created and shared my Mason Jar Utensil Caddy; I’m happy to say it’s been very well received with over 19,000 repins on Pinterest 🙂 I hope I’ve inspired a lot of DIYers out there to make their own. A dear friend I’ve known since we were in high school (yes that’s decades ago) asked if I was making her one. I know she was teasing but I realized it wouldn’t take as long to put one together when I didn’t stop at each step to take pictures. She had a “milestone” birthday coming up shortly so I decided to make her one. I surprised her with it when we met up to have lunch with several of our other high school friends for her birthday. Then today I received a text from her with this picture. Her text said, “What do you think? It was sitting on my side table so dejected, on a whim I bought some flowers at Trader Joe’s. Loving it!! Seriously, I loved it and immediately replied that I loved it!!! And I told her I couldn’t believe I never thought of using mine as a vase. 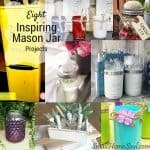 Which had me shaking my head since Pinterest is full of images of hanging mason jar vases. Then this picture came through, so lovely!! And finally this one, how sweet does this look? It’s so fresh you can still see the water droplets on the jars. I’ve included the parts list below so you can gather your supplies and be all ready to create your own mason jar flower caddy. The full tutorial to build your own can be found here. The only steps that will be different is staining versus painting your board. 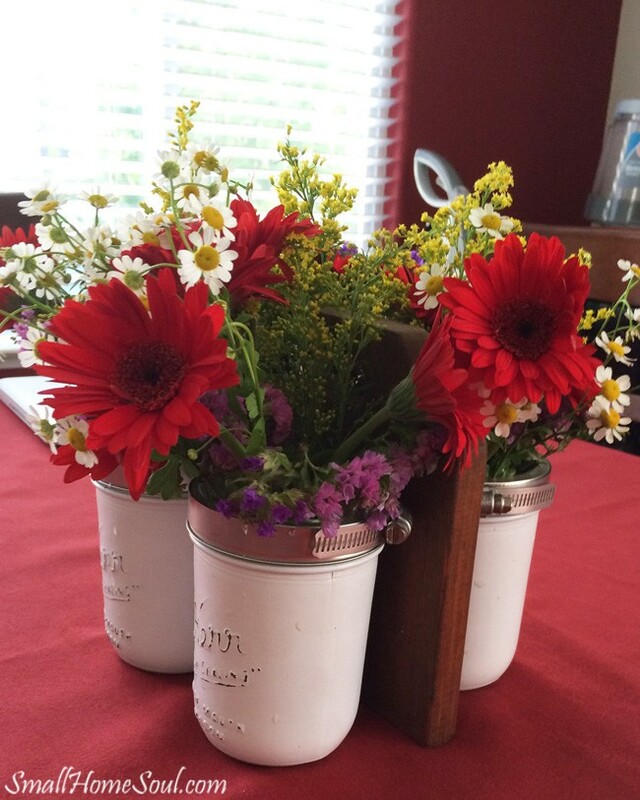 I really think you need one of these mason jar flower caddy’s, don’t you? Adorable mason jar craft. I love the caddy and the beautiful flowers you used to display the caddy. Thank you so much for sharing at Snickerdoodle Create~Bake~Make link party! Love it!!! It is such an awesome idea!! I would have never thought of that!! Thanks so much Anika!!! I know, right? I’ve looked at so many flowers in mason jars and never connected the dots! 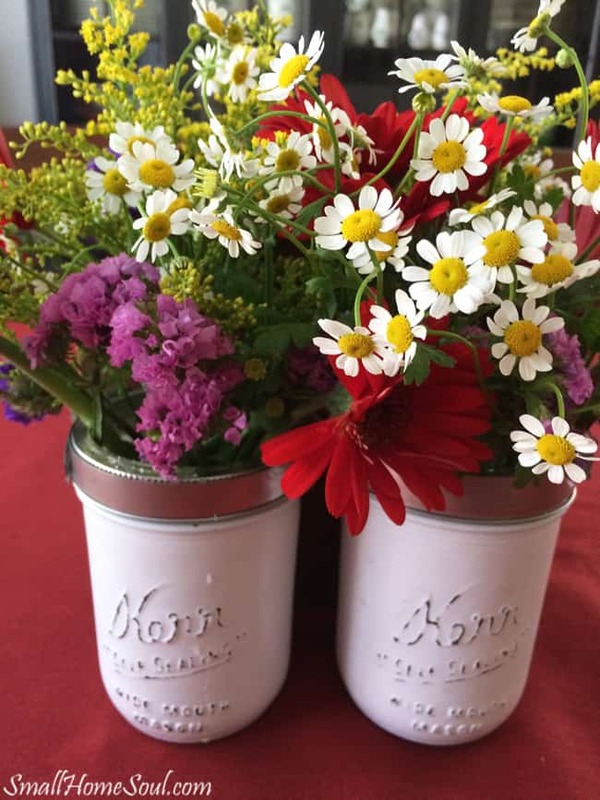 Mason Jars and Flowers! Who wouldn’t love this one. Great project! Thanks Patti, it’s a beautiful combination so everyone should love it! Love how this turned out! They would make such lovely Christmas gifts or any time of the year gifts!! Love how you stained the wood also! !